A website's revenue potential is based on the amount of traffic it receives. Brand's and their accompanying websites have been sold for millions based solely on the amount of traffic they receive. Without traffic, no article I write will go beyond my own computer. No landing page will ever convert a lead; no social promotion will ever garner a Follower; no A/B test will ever reach statistical significance and no email drip campaign will ever send a single email. So it pays to know how to get more of it. This article will break down five high-level ways to drive traffic to your website. Many businesses focus on all five of these processes, some on just one, and some on a combination. What works for you will depend on a million different variables including (but not limited to) your own experience, natural ability, time, budget, industry and available resources. I'll also be giving a few recommendations for how different industries can use each of these strategies. As you read these words you're smack dab in the middle of inbound marketing. I wrote an article which you found and clicked on. You found me. If you're reading this article soon after it was published, you likely encountered it on social media or via email. If you're reading this more than a month after it was published however, you likely encountered it from a search. That second part is all about SEO: the strategies which improve the chance of someone finding your content when they search online. You need to have the resources to, consistently, publish interesting content several times a week: Interesting content usually consists of blog articles, slidedecks, infographics, podcasts, downloadable resources, social media posts and more. You need to have patience: The mass majority of our inbound marketing success comes from content we created several years ago (known as "evergreen content"). You need to get the basics right: Write well (if not you, invest in someone who can). Learn SEO (it's mostly link-building, to be honest). Track your efforts. Create a content calendar. Read the ebook I've linked below. You need to monetize the content you create: Just as there's no point in having a website without traffic, there's no point in driving traffic to content not ready to receive it. There's a link for that below as well. If you don't feel like downloading anything, check out my article The Complete Guide to Blog Monetization. The best strategy I've seen for the hospitality industry is based around tourism. Consider that, before anyone types "Best hotels Antigua" into Google, they type "Is Antigua cool?" (or something similar). If your hotel, spa, resort or B&B can create content targeting that search, it's incredibly easy to maneuver your message from "Antigua is cool" because of the blue water and white sand beaches" to "Pure Blue Resorts has exclusive access to a half kilometer of blue water and white sand beaches." Make sense? You might be surprised at how powerful inbound marketing is for the automotive industry. Your prospective customers are looking to learn more about their vehicles. They're looking for the solutions to an issue they're experiencing. They're looking to know about the most recent development in brakes, adjustable suspension or a new supercharger. A huge component of inbound marketing is education, and that plays right into the hands of an industry in which 95% of the market is pretty much clueless, but wants to learn more. Where inbound marketing is about you finding me, outbound is about me finding you. Rather than you stumbling across Wishpond from a random Google search, with outbound marketing I'm actively looking up prospective clients and reaching out to them. Outbound marketing used to be the way to market a company. When you think of marketing before the year 2000, this is it. We're talking TV commercials, radio ads, leaflets, cold calls right as you sit down to dinner, trade shows, etc, etc. So is outbound marketing dead? No. Not at all. It still has its place and probably forever will. Is it less dominant than it was 10 years ago? Absolutely. But outbound marketing still has a role to play in every industry. You need to target well: There's no point in cold-calling a yoga studio if your business creates mufflers. Don't waste your time. You need to play the numbers: 100 cold emails sent out every day to well-targeted businesses should result in 15 or so replies (20 if you do follow-up) and a dozen signups. That's worth it. Sending 10 emails? Probably not. You need to hone your strategy: If you're sending 100 emails to prospective customers, make sure the 90 which don't reply don't hate you: Test your templates. Don't be aggressive. Keep it short. Try to personalize. Use case studies. Automate: If you send 100 emails a day by hand you'll be lucky to break even for your effort. Consider using marketing automation to make it a bit easier. How do I find the information of prospective customers? Try database platforms like Salesforce’s Data.com, InsideView or Hoovers. I'm reaching out to you because I have an idea which I'm confident will boost [prospective company's] lead generation by 50%. I can explain in just 20 minutes. This strategy was recently implemented by [prospective company's competitor/well-known brand] and resulted in a 310% increase in monthly leads. Can you find 20 minutes this week or next to discuss this strategy? When works best for you? Before you start anything, create a survey (SurveyMonkey actually has a new function which allows you to reach non-customers). Determine the primary pain points of your competitor's users. Use one of the platforms I referred to above to find a solid database of potential clients. Compile a professional, appealing whitepaper or case study (but don't send it in your first touchpoint!). Either call or email - ensuring you lean heavily on the known pain-points in your pitch - and track your results carefully. Test, analyze and try again. One of the most effective outbound marketing strategies is affiliate marketing, in which you incentivize influencers, bloggers or social media gurus to promote your business in return for a cut of the sales. Wishpond has done this to great effect by cold emailing (or even calling) bloggers who have done affiliate work before or have popular "platform comparison" content. Create an affiliate package of recommended content, case studies, testimonials etc and deliver it upon request. The cut Wishpond offers is 30% of a customer's lifetime value. Social media is a part of inbound marketing, but (as it's possible to employ a social media manager who doesn't work in content directly) I'll break down exactly how it works anyway. Without a Fan base or Following, it's difficult to drive traffic with social media (particularly in the early stages). I recommend a simple, market-targeted social promotion to get you rolling. Even with a large Fan base, you may be better off putting your energy into lead-generation than social media popularity. This depends very much on your industry and business, but is definitely something to consider nonetheless. What's more valuable to your business, a Like or a Lead? All businesses should have a presence on Facebook, even if it's just as another link to their site or to provide a location to prospective customers. I recommend Twitter to all SaaS companies, marketing companies, sports-related businesses, and all news organizations. Twitter, more than any other platform, is tied to in-the-moment developments. If your sector or business is based around things that are happening now, you need to be on Twitter. Tech and engineering companies as well as marketing individuals. The top three brands on Google+ are Android, Mashable and Chrome, with Android leading the pack by a significant margin. Fashion, photographers, jewelers, home-hardware stores (DIY). The female-dominated, image-dominated elements of Pinterest make it easy for those brands which naturally lend-themselves in that direction, and very difficult for those brands which don’t. To learn more about which social platform is right for your business, check out my article "Social Media Marketing: Which Platform is Right for your Business." We've covered the strategies to drive traffic without paying out of pocket for it (though of course your time is valuable in itself), so let's move on to paid ads. I've been a big fan of Facebook Ads for a couple years now. With no other platform can you showcase your brand to so many people for so little (about 35 cents/1000 people). Facebook Ads, if done well, can also deliver a better ROI than any other traffic-driving strategy. Targeting: Facebook allows you to reach people based on the most minute details of who they are. For instance, promote your "singles yoga" business in Denver, Colorado exclusively to people between the ages of 18 and 35 who have expressed interest in yoga and who have been single for more than 2 months. And that's just the start. Advanced Capabilities: Facebook's custom audience targeting allows you to import a list of contacts and promote your business or campaign solely to that list. 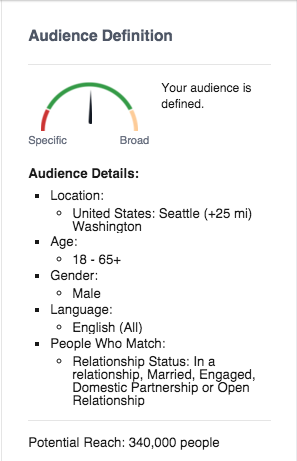 Lookalike audience targeting allows you to find Facebook users who match your custom audience list in terms of demographics and well as behavior, characteristics and online activity. Website custom audiences allow you to create a Facebook ad audience within Facebook made up solely of people who have visited a page of your website, and then promote your brand to drive them back. Meet your New Year's resolutions! Valentine's Day is coming up. How about 10% off a spa day? This one's incredibly straightforward. 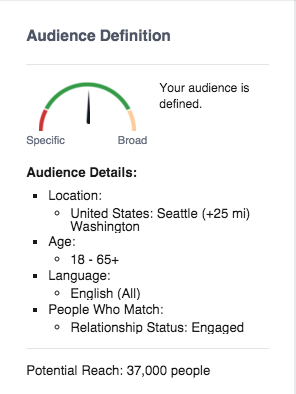 The Facebook Ad platform allows you to target Facebook users who have set their relationship status to 'Engaged.' Target this audience with an ad promoting your "Spring Wedding Promotion of 25%-off until July." For this promotion, create two ad sets - one targeting women and one targeting men. Create different ad copy and different images to appeal to each gender, as an ad which targets both won't be optimized for either. The ad audience I have on the right may be somewhat small, but small audiences like this are very worth testing. Ramp up your ad budget (as you'll only pay for people who click) and see what happens. If you don't get clicks, you can always adjust your audience or budget to make it work. To learn more about Facebook Ads, check out my complete guide at The 2016 Guide to Facebook Ads. Google's Adwords platform is, while being a bit more pricy than Facebook's, perhaps more powerful. Firstly, when we're talking about Google Ads we're, generally speaking, talking about ad impressions based on your own behavior rather than who you are (as with Facebook). What I mean by "your own behavior" is what advertisers call "intent-based advertising." If you've searched for something, Google Ads shows you a paid answer based on what you searched. If you have visited a website, but then left that website, Google Ads shows you an ad based on that visitation. If you have written something in an email, Google Ads shows you an ad based on what you've written. Pretty damn powerful, if you ask me. Now, Google does also have some profile-based targeting, location-based targeting and, as of late last year, custom list-based targeting which allows you to import a contact list and then target those individuals specifically with Google Ads. But Facebook can do all that too so I'll ignore that for the purposes of simplicity. This past weekend I booked a vacation for this coming November, so it's no surprise to me that (based on my search history) I'm being targeted on YouTube by companies associated with travel. Top Tip: Perhaps the most essential element of any optimized online advertising strategy is the page your ads send traffic to. 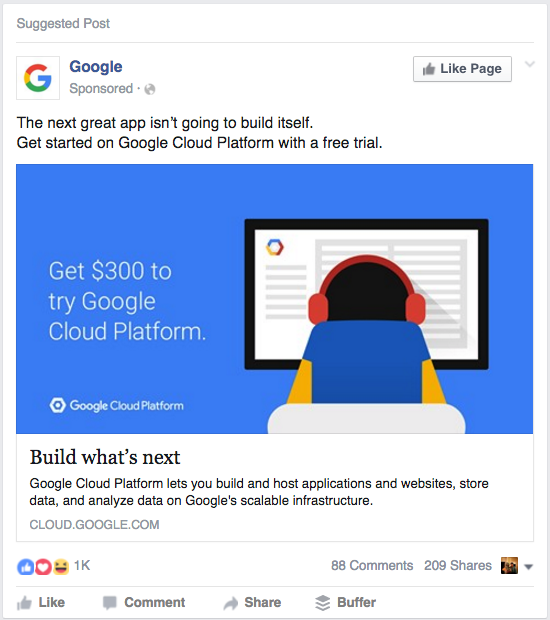 There's no point in spending any money or time on a Facebook or Google Ad if the campaign's landing page isn't optimized to receive it. Learn more about how to optimize your ad's landing page for ad traffic at "3 Examples of Landing Pages Optimized for Facebook Ad Traffic." Ecommerce sites absolutely have to be using Google Adwords. 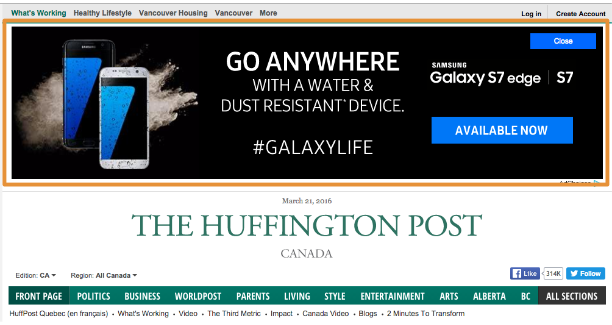 That whole "intent-based" advertising thing works far too well for people searching for products to avoid it. 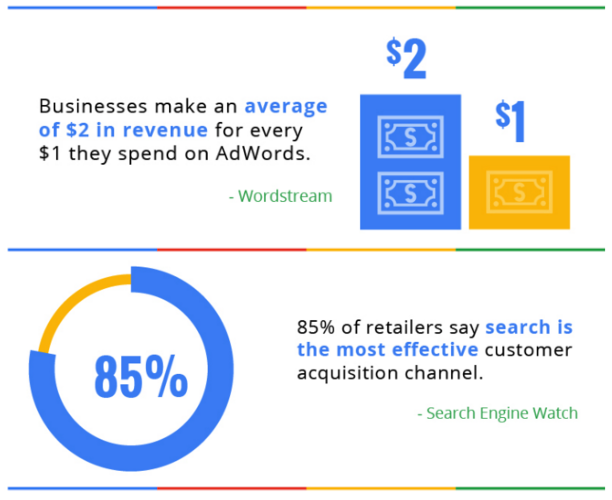 To learn more about Google Ads, check out "10 Google AdWords Mistakes You Need to Avoid: Beginners Guide." Hopefully this article has given you a bit more insight into how to drive traffic to your site, and also how important it is. But remember, traffic is only half the battle. Utilizing these five strategies is essential, but it's just as essential to consider the site you're sending people to.